For the first time in decades it has these days little by little become acceptable to officially discuss about the needs of those preferring urban lifestyles. In 2014 however, urbanity seemed to get raised, I felt, on an entirely new level and became perhaps the most discussed topic when referring to megatrends shaping cities today. Even if I might be looking at world through an urbanist’s eyes, I’ve never experienced so much focus given on the issue in the media and professional circles. Apparently as more people from an urban-oriented generation are entering and progressing on the job and housing markets, and retiring baby boomers are trading suburban castles with access to services, many decision-makers and public institutions are waking up to a need for updating their assumptions on what makes cities livable. 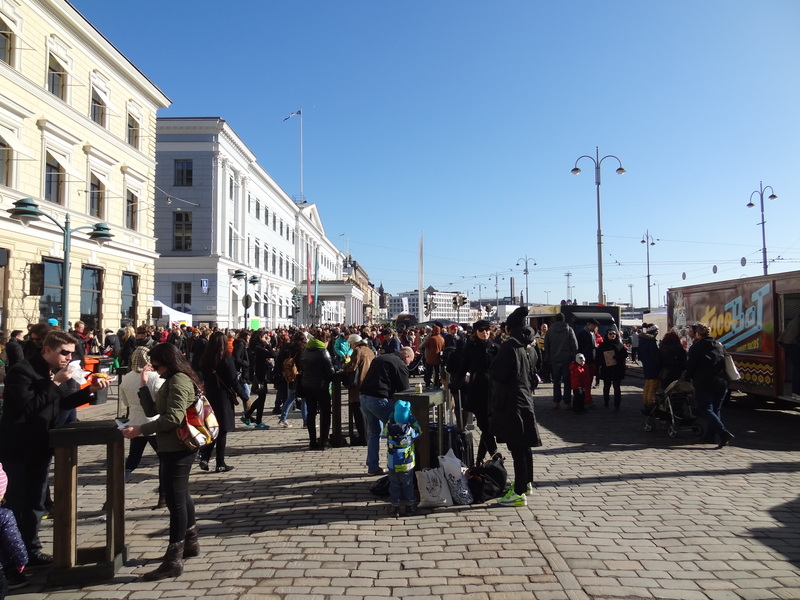 Big crowds, a great selection of food trucks and early spring sunshine at Streat Helsinki, the city’s first street food festival in March 2014. Progressions have come big and small. We’ve for example experienced a decision from Helsinki to ease the operation of food trucks in the city. This is a gigantic leap from the initial response of immediately banning the first mobile café that appeared on Helsinki’s streets in 2011. But what makes the past year exciting is that Finnish cities have also witnessed plenty of big moves. Undoubtedly the most ambitious and game-changing event in this context is Helsinki’s new city plan draft that was published in late 2014. City Plan Manager Rikhard Manninen of the Helsinki City Planning Department sums the goals of next-era planning up nicely: : “We will need more space for enterprises near the city centre and more housing to meet the increased demand for urban housing”. 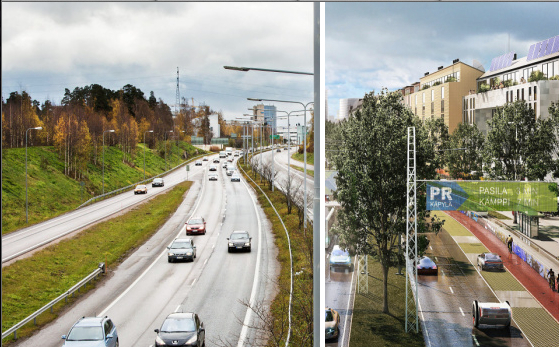 Helsinki will be seeing plenty of motorways-to-boulevards retrofits. And the idea is already discussed in other cities, too. Image courtesy of Helsingin Sanomat. Follow this link to try virtual boulevardization. One feature in the new city plan is especially inspiring. Helsinki has decided to retrofit virtually all major entry roads leading into the city from wide motorways into Champs-Élysées-like boulevards. This strategy for intensification is not a novel idea as such, but the scale of how it’s planned to be done in Helsinki is. Motorway boulevardization could offer Helsinki realistically the potential of developing about 6 to 8 million square meters of new floor space along the new boulevards according to calculations. I don’t believe any city has planned road conversions of this scale so far. And it’s not only Helsinki taking urbanity seriously. Cities across the country have started to draft strategies for inwards-directed development patterns or revealed potential pathways to build on underperforming sites around their inner cities. For many cities this principally means the environs of their railway stations. The city of Hämeenlinna staged a competition this year for ideas how to develop the environs of its railway station. This is the winning idea “Svengaillaan” by Serum Architects. Unlike in many parts of the world, Finnish railway stations are often quite disconnected from the rest of the city due to their large footprints dedicated solely to railway operations. This is because the state owns and regulates everything related to trains and they’ve always been solely interested in keeping trains running and not so much on where they’re going. Now cities are discovering that the empty areas around railway stations are locations that many future residents will find attractive. Not to mention that filling in the barrier-like voids will result in better connectivity within each city. Another example of a big urbanity move happened in Finland’s second city, Tampere. At the beginning of the summer the city decided on introducing a long-discussed high-speed tramway. If the initiative one day materializes, it would not only begin a new chapter in the history of Finnish public transportation, but would also guide land-use planning along the tracks for years to come. Moreover, the city took a head start into an era of less driving and more efficient transit services by banning private cars from a segment of its main street. If all goes well, also the remaining stretch of the street is bound to transform into an extension of the transit-only corridor in the city center. 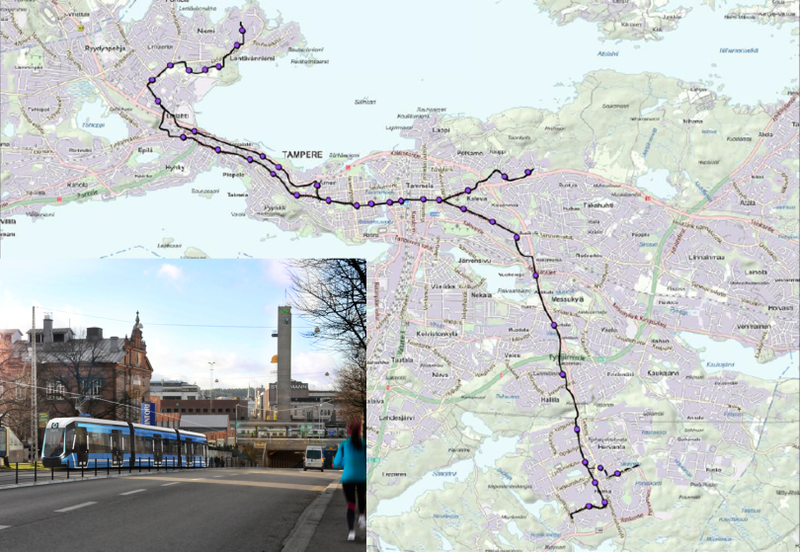 Tampere’s upcoming tram system. Sources: The City of Tampere/IDIS Design Oy. Number two on my list is in fact a non-development. Despite the eager adoption of an urbanist paradigm to guide Finnish urban planning, we are yet to see it materialize anywhere. On the very contrary, this year we’ve for example watched new shopping malls open all across the country, upcoming ones getting showcased in grand style, the same worn suburban building designs getting built over and over in every single city and town, and a lot of resources getting tied into facilitating driving. The stuff actually happening on the ground is nothing different from the same car-oriented and suburbia-embracing development patterns that have shaped our cities since WWII. Naturally, many of the projects that got completed during 2014 were planned years earlier and therefore don’t necessarily mirror today’s values. But the core concern is that nothing new which would do so has emerged. The reality is that the culture of developing things in our cities speaks a very different language than urbanites like me are hoping to hear. In the coming years architects, developers, and planners are necessarily facing a colossal challenge in shaping built environments that speak to those seeking urban lifestyles. The third item on my list is the firm arrival of highrises into Finnish urban landscapes. Building tall is a topic that has always sparked extensive debates on the aesthetics and geography of highrise-construction. The big issue has been not being able to find a consensus on their relationship with the historic cores of cities as skyscrapers would obviously alter the cityscape forever. And with our track record of building, there is a high risk of introducing yet another eyesore. Cirrus dominates the suburban landscape in Vuosaari. This has led to only a handful of test rounds in remote locations. A good example of this is Cirrus, a 26 stories tall residential tower tugged away into Vuosaari, 12 km to the east from Helsinki’s center. In 2014 however, it seems that a consensus of some sorts has been reached. In October this year, we’ve not only welcomed a new member to the highrise family, Tampere’s new 25-storey landmark Solo Sokos Hotel Torni, but also seen building permits approved to two highrises (35 and 32 stories tall) in Kalasatama right next to Helsinki’s inner city, a new 21-storey highrise close to the new hotel in central Tampere, and a 16-storey hotel in the Jätkäsaari redevelopment area to the south of Helsinki’s center. Furthermore, Helsinki just kicked off a design-build competition for a highrise park on the northern edge of the inner city. The idea is to erect 8 to 10 new towers right by Pasila‘s railway station. 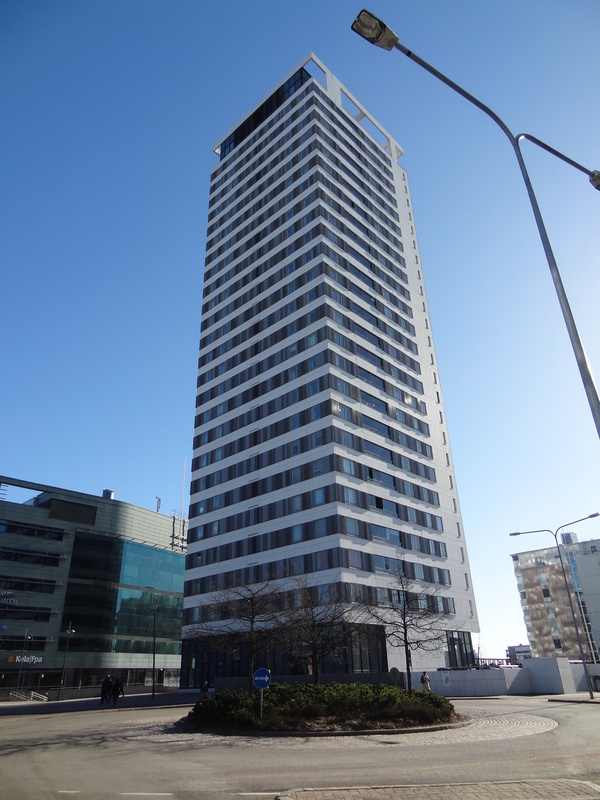 Tampere’s new Tower Hotel. I always wonder why it has so small windows. Luminary, Tampere’s next highrise. Image: Skanska. Helsinki’s skyline will change for good once these Kalasatama towers are ready. Image: SRV. Originally, Jätkäsaari was supposed to get a 33-storey hotel. But after fierce debates it will get one with 16 stories. Image: Arkkitehdit Davidsson Tarkela Oy. Following this year’s highrise developments, it’s clear that whether you like them or not, they’re here for good. Other cities will look at the examples from Helsinki and Tampere and I’m sure every major city will soon be making decisions over how tall their new landmark will be and where it will be located. I don’t have any strong feelings for or against highrises as such, but I am extremely concerned about their impacts on the city at street level. Unfortunately when someone mentions the word skyscraper, our planning culture is more likely to generate daydreams about Le Corbusier’s towers in the park than e.g. the Vancouver model which tries to combine tall building and a good street-level experience with a podium of human scale structures. If we must build tall, rather with the latter model, please. The site for Helsinki’s highrise design-build competition in Pasila. I really hope those who take part won’t let this cover image by the city fool them into thinking that only ideas that would make Le Corbusier proud are accepted (or is it so?). Image source: helsinkihighrise.fi. Technology keeps on bringing new solutions and enhancements for addressing urban problems. In 2014, the main Finnish issue in need of upgrading has clearly been transport. By a long stretch, the most discussed topic was Helsinki’s vision of getting serious with a new concept called “Mobility as a Service”. Here in Helsinki, we are now able to use different modes of public transport (buses, commuter trains, trams, the metro, on-demand minibuses) through a single service provider. But through her master’s thesis commissioned by the city and published this year, Sonja Heikkilä introduced an idea to expand that ease of switching transport modes to include bicycles, for-hire cars and ridesharing. Pretty neat, huh? The argument for advancing the concept is linked to observations that young adults drive less and increasingly don’t care about owning a car in the first place. The new mobility service would thus make it easier for people to have access to a car on those occasions when they’d really need one. It also provides a welcome opportunity for car owners to reconsider their relationship with their vehicle. The truth is that most cars are not mobile for something like 95% of their lifespan. In a changing attitude environment, some might consider trading car ownership with an option to buy the right mix of mobility they in fact need in their lives in a bundle. 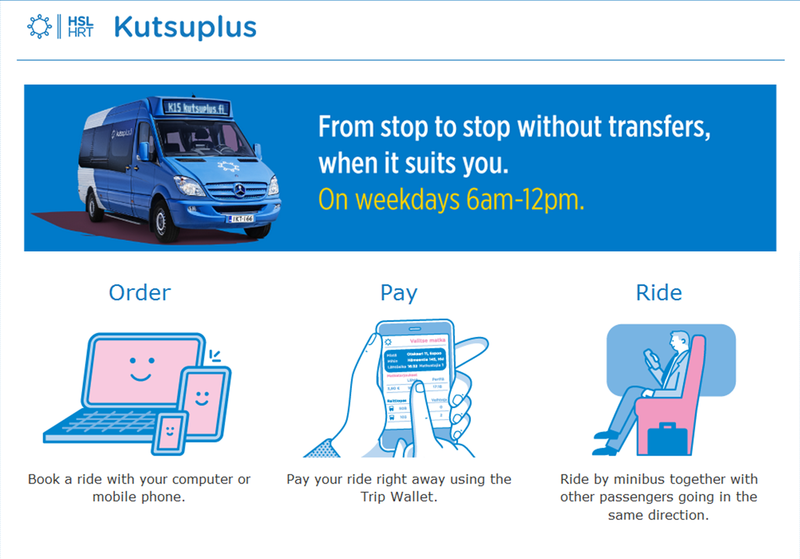 2014 has been the first full year that Helsinki’s new on-demand minibus service Kutsuplus has been in use. It’s like taking a communal taxi. And dirt cheap compared to taxis. Smart. Image source: kutsuplus.fi. Another interesting tech-related transport story from 2014 is the arrival of Taxify (in Oulu and Helsinki) and Uber (Helsinki) to disturb the peace of the local state-enforced taxi monopoly. Taxis are highly regulated in this corner of the world, which essentially means that on the one hand service quality is standardized across the country, and on the other there’s a risk of unnecessarily high fares and a state of stagnation within the business. Both Taxify and Uber landed primarily to compete with the local smartphone apps that connect customers with taxis. In addition, Uber also launched its well-known service that connects private drivers with those in need of a ride, but in practice this hasn’t been active yet because the service is illegal under current circumstances. This latter service from Urber splits opinions wherever the company goes, but I am glad they came to Finland. Mostly because services like Uber and Taxify force the local taxi business and decision-makers to critically evaluate how the taxi monopoly’s business-as-usual way of doing things compares with user-expectations. And this is important not only because of taxis, but because Finland’s bus and coach servicing was opened to competition this year and even the railways may face the same one day. After years of no real need for inventing customer-friendly services, all ideas and attempts for making the experience of moving in and between cities better than ever are highly welcome. At the end of summer, Finland’s central government came up with an interesting and unprecedented twist in their 2015 budget proposal. The state agreed to support major railway infrastructure projects in the Greater Helsinki region and in Tampere on the condition that local governments get serious with advancing the speed and volume of their housing supplies. There are three factors why this is interesting and unusual in Finland: 1) rail projects usually don’t get prioritized over expanding the road network; 2) The main urban centers are conventionally not the priority for public investments (declining regional centers are); and 3) without saying it out loud, the state seems to have picked up an active interest in formulating a national urban policy framework of some sorts to lead a more visible role in Finnish urban development. 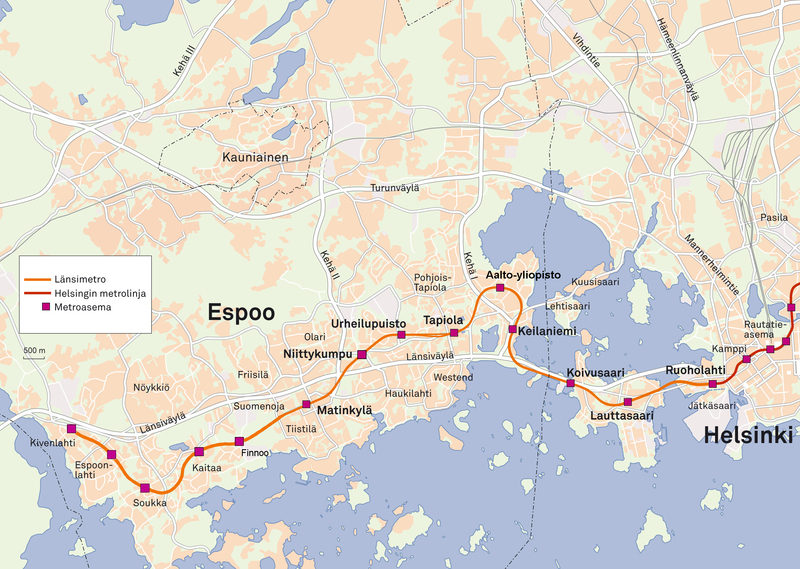 In exchange for more housing, the central government promised it would support the extension (Matinkylä-Kivenlahti) of Helsinki’s metro extension to the west (Lauttasaari-Matinlylä). I hope they understood to make the deal legally binding. Image source: Länsimetro’s Flickr account. One half of the big picture behind this move is that municipalities within large urban centers have historically been more concerned with competing against each other than developing the urban area collectively as a single entity. This is partly why cities in Finland are so sprawled out and some transport solutions might feel strangely planned. The other half is that traditionally the central government hasn’t really been interested in steering what happens in the larger urban areas. Conversely, a lot of money has been spent throughout modern history to e.g. support motorway projects around smaller cities with the belief that this would strengthen local economies. On top of the financing initiative, the central government confirmed its interest in developing Finland’s key cities by handing Malmi airport in Helsinki over to the city in order for it to be retrofitted into a new neighborhood. 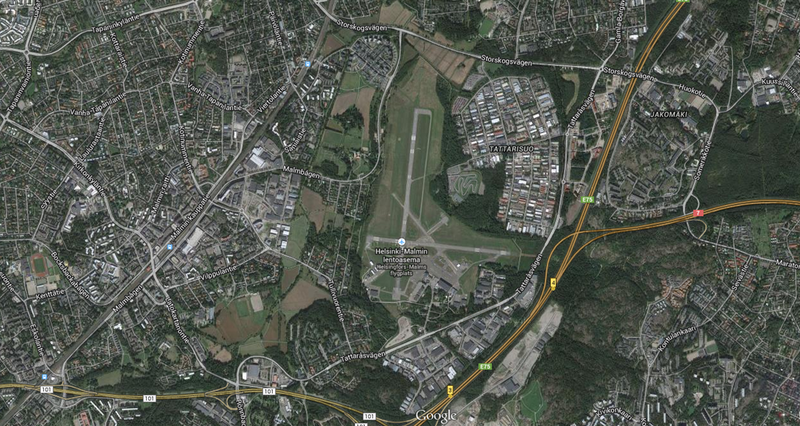 Malmi airport is getting surrounded by sprawling Helsinki suburbs. Image courtesy of Google Maps. This small historic airport was once the nation’s main airport, but for decades it’s just serviced general aviation activities. When it got built, the airport was far away from the city, but now it effectively blocks all chances of connecting neighborhoods in North-East and East Helsinki with each other. Discussion and negotiations over the airport’s future have been fierce and many, but it now seems that 2014 will remain as the point in time when an irreversible agreement got reached. My wish for 2015 is that the central government could get its act together in its project for reforming the municipality system. A natural extension of this newly found interested towards the urban would be a system that focuses on addressing the problems of urban areas. Last but not least on my list is a new challenge for cities that’s made up of a rising number of self-confident young adults who are 1) increasingly equipped with a kind of do-it-yourself spirit; 2) interested in solving societal problems; and 3) armed with social media tools and new tech which empowers them to take part in doing so. This equation adds up to more non-profit initiatives and social entrepreneurship, less faith in government institutions when the goal is to help change the world. 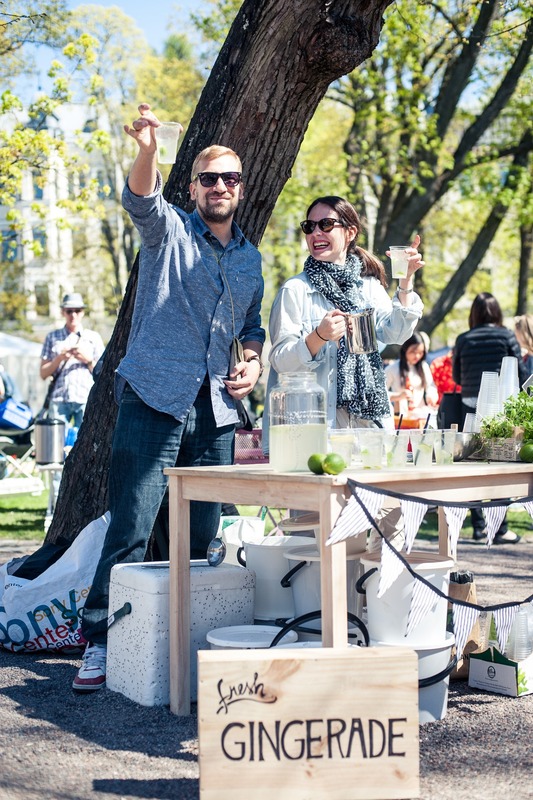 Happy people behind the Ginger Bar on Restaurant Day in May 2014. Photo by Andrew Taylor/Restaurant Day. This of course is not something that can be contained to 2014, as we’ve seen diverse proactive urban movements like Restaurant Day, Cleaning Day, and neighborhood Block Parties hack the cultural services sector in Helsinki and beyond during recent years. But I believe this new culture of civic engagement is amplifying. The visible events and projects are just the tip of the iceberg. This year I’ve also had the privilege of being part of the “phenomenon’s” quite substantial spill into the field of urban development and planning. Haaganpuro. 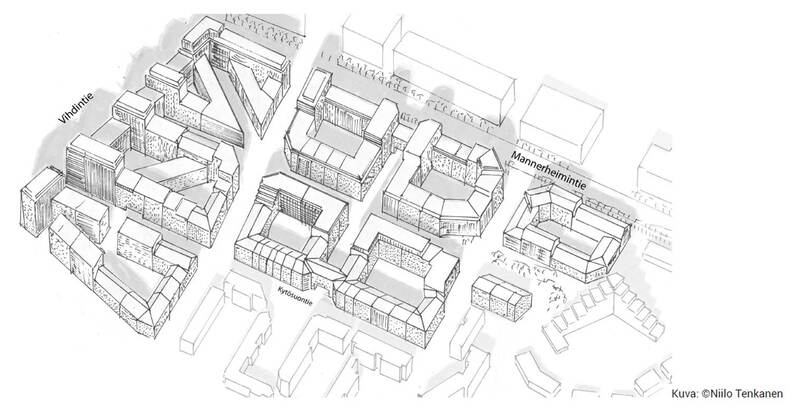 An urbanist vision for expanding Helsinki’s inner city. Image by Niilo Tenkanen. My contribution is through a non-profit group called Urban Helsinki. We formulated two alternative urban plans, Haaganpuro and Pro Helsinki 2.0, with a goal to disrupt business-as-usual urban planning activities and to address a major issue in planning: it is a very difficult topic to discuss about. Typically, things work so that the city drafts a plan which offers a suggestion for developing a certain area, and throws it out for public review. But the problem is that it can be difficult even for professionals to fruitfully comment on a draft plan when there is just one way of developing to discuss. So we decided to offer alternative visions to compare against. Pro Helsinki 2.0. 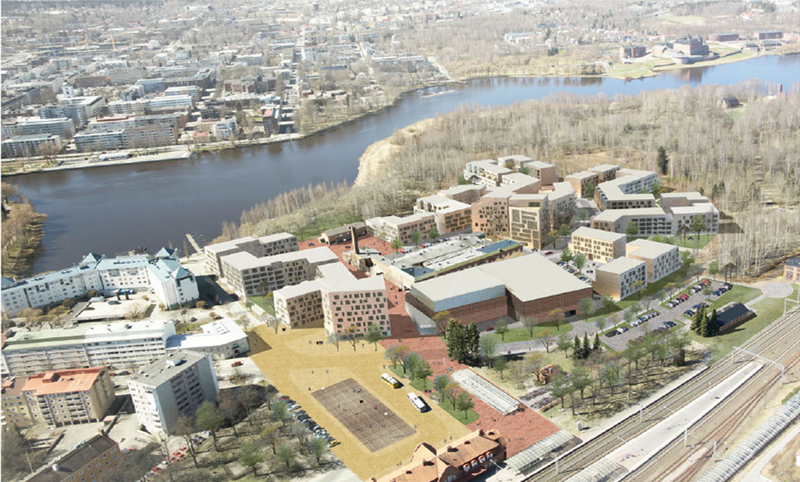 The even more urban alternative for Helsinki’s new city plan. Image by Urban Helsinki. View the full zoomable map here. And what’s great is that it’s not only us. For example in 2014 a collective of young architects named Uusi Kaupunki who want to “encourage municipalities, communities and companies to use architecture and planning as a tool for problem solving” have marched on to our TV screens with their own show (yeah, the group was founded in early 2013, but this year everyone got to know them). Moreover, Lahti witnessed the founding of Törmäämö, a co-op that basically functions like a communal grassroots regional development office. They want to help micro-enterprises by e.g. providing temporary facilities, access to networks, collaboration opportunities – you name it. On the tech front, Collaplan launched a closed beta version of their tool designed to help architects, construction developers, cities, and end users collaborate better for all of us to enjoy inspiring built environments. The flipside of the same coin is that while we today have the know-how and desire to go proactive about changing the world, it works the other way, too. Mobilizing people to protest against an experienced injustice has never been so easy. For instance, after the owner of Helsinki’s oldest movie theater Maxim announced in November that it wants to close the cinema and transform the building to serve other purposes, a movement to save the theater grew over 8 000-strong in less than a week. A couple of weeks later the owners revealed that – even if not in the way they used to – a part of Maxim will continue to screen movies. 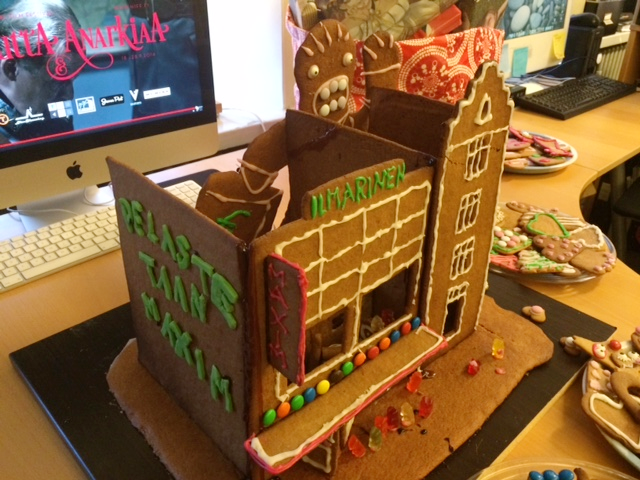 A protesting gingerbread house to save the movie theater Maxim from evil plans of the building’s owner Ilmarinen. Today’s protests function on so many different levels than in times when people would just gather on the street. Image source: Pelastetaan Maxim Facebook page. In my opinion, if institutional players such as city planning departments in the context of urban planning still want to orchestrate their activities smoothly, they will need to learn ways of stepping down from their ivory towers and begin practicing methods of co-creation with more open agendas. The era of centralized top-down governance seems to crumble down, little by little, every time someone decides to take part in a new non-profit venture for a brighter world or invents a way of doing something a thousand times better than the public sector is. With these thoughts, thanks so much to all of you dear readers for sticking with me and engaging on discussing the state of Finnish urban planning and development. I wish you all the best for 2015! Previous PostChanging Work Patterns and the Rise of Urban Innovation Districts – The Future in Finland?Next PostK+S Urbanism – Will Mega-Retailers Kesko and S Group Ever Think Outside the Box? It’s nice to remember that not only bad things happened in 2014. #5 is very encouraging and I hadn’t heard about it! Yes it is, I hope the government will continue on the same path. But I fear that the central party will win the elections this spring, because they are the embodiment of anti-urban attitudes. Reblogged this on Urban board. why does everyone think closing Malmi airport is such a necessity? you can’t tell me that is the ONLY place in all of Helsinki and its surrounding area to place a couple of neighbourhoods? Or to jam pack it with 3-4 story rentals and make it the same claustrophobic s#%t that is already the problem in finnish architecture.. oh yeah, your neighbour is the car graveyard, mechanics shops and parts dealers. but no no, the government is opposed to clearing those, because hey, small business, right? you couldn’t possibly force them to move! not to mention the cost of cleaning the area where this airport has been operating for nearly 100 years, and its cultural significance. and then they come up with the idea of building a new airport in Espoo. because throwing millions at a brand new airport is more economical than extending a current runway and updating the technology at Malmi to make it possible for business and charter aircraft to operate from it..
sorry for the rant, just my two cents 🙂 I’m all for other urbanisation tho, in fact, i love it!